Cell Phone Lot: To pick someone up at JFK - use free Cell Phone Lot waiting area, located near the airport entrance, off the Van Wyck Expressway. All terminals are reachable from this lot in less than 5 minutes. The lot, with over 70 spaces, allows drivers to wait until their arriving passengers have disembarked the aircraft, collected their baggage and are ready to be picked up. The JFK Cell Phone Lot not only provides a convenient place to wait for arriving flights, but also keeps traffic on the airport moving smoothly. Drivers must stay with their vehicles at all times. There is no parking or waiting allowed on the airport roadways at any time. Kiss and Fly: Another alternative to your dropping someone off at the airport, Kiss & Fly is located at the AirTrain JFK Lefferts Boulevard Station where AirTrain service is free and travelers arrive at their terminal in just minutes. 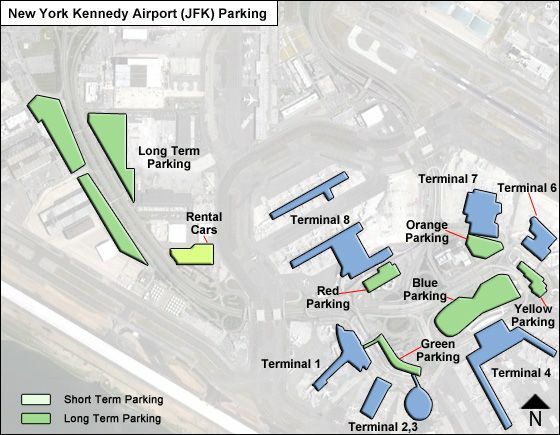 JFK Valet Parking: The Valet Parking Lot is conveniently located at the Lefferts Boulevard AirTrain Station. Drop off your vehicle at the lot and get free AirTrain service to your terminal in minutes. Valet Parking at JFK is safe and secure. When you return, your vehicle will be waiting for you. Fees: First 24 hrs or part thereof - $24; Each 12-hr period thereafter $12. Up to 24 hrs - $18; each 8-hr period thereafter - $6. First 30 mins - $3; up to 1 hr - $6; Each add'l hr - $3, up to Daily max (24 hrs) - $33. Payment Method: by E-ZPass Plus, Cash (U.S. currency), check (in U.S. currency), MasterCard, Visa, American Express and Discover Card are accepted for payment of parking fees.